Unfortunately, as most regular dieters know, weight loss rarely follows a straight line. The weight comes off nicely for a couple of weeks, then very little for a week. Then it’s dropping again; then either nothing at all, or it even goes up … before dropping again. Finally, it grinds permanently to a halt. You’ve now hit the dreaded ‘plateau’. At this point, further weight loss is now about as likely as politicians keeping their pre-election promises! So, what’s going on? And what can you do about it? Avoid it in the first place. Your body is continually fighting to stay alive. To improve its fighting chances, it has evolved a highly adaptive metabolism. One that is designed to preserve your life when food becomes scarce. Now, it doesn’t know there’s a supermarket down the road, or you have an emergency tin of baked beans in the cupboard. No, it only knows that you are currently starving yourself. Plus, it’s being forced to give up some of its precious, life-saving body fat stores to keep you going. So, it prepares to defend against further assault on your unwanted wobbly bits by changing its metabolic rate. Just as you balance your financial income and expenditure, your metabolism is in charge of your energy in/out account. First, it ensures that you are spending wisely. And then, if you have anything spare, it puts it aside for a rainy day (by filling up your fat stores). So, let’s see if we can use this balance sheet/metabolism scenario as a useful analogy. Imagine that you have a very comfortable lifestyle. You run a successful business and enjoy a very good income. You buy designer clothes, shop at Waitrose and drive a Jaguar sports car. Life is good. But what happens when business starts to drop off? (i.e., you reduce calories and go on a low-calorie diet). For the first few weeks, your bank balance (metabolism) is not concerned. Your deficit in savings is probably just a temporary glitch and things will pick up. So, you don’t do anything and accept the situation. However, things continue to deteriorate, and you must make some savings. You swap the Jag for a mid-range BMW, buy your clothes from M & S and groceries from Sainsbury’s. But, you’re confident that things will pick up and you feel these changes are only temporary. But they’re not. Things have not picked up, in fact, they’ve got worse. Your business is now in trouble and you are now fighting to survive. Your BMW is now a second-hand VW Golf, clothes are from a discount store and you shop at a budget supermarket. Eventually, the situation stabilises and you’re finally breaking even. Your business is just about providing enough income to survive, but the outlook is bleak. You no longer think things will pick up and resign yourself to your new lifestyle. This is as good as it gets and you’ve got to get used to it. You remind yourself that it’s survival first. But what happens if things pick up? Money comes in again and the light at the end of the tunnel is no longer that of an oncoming train. Will you immediately return to your previously lavish lifestyle, or keep to a frugal existence? Has your outlook become forever damaged by what’s happened? Well, not everyone is the same and likewise, neither is how their metabolism responds to a diet. Some people will instantly return to the same point prior to the problems. They’ll buy a new sports car, start shopping at Waitrose and forget all about survival. For these people, dieting is not an issue and their metabolism is happy to move up and down with the times. Many others, however, are not so lucky. Both physically and mentally, they have been damaged. Metabolically-speaking, they have been declared bankrupt. For these people, their metabolism will stay at ‘survival levels’ just in case things take another turn for the worse. And it may be months, possibly years before they feel like spending again. And until they feel it’s safe to do so, they’re piling every spare penny of their new income into a high interest account. In metabolic terms, they are increasing their fat stores. But not everyone suffers from this extreme either. In truth, most people will fall somewhere into the middle ground. They’ll increase spending but not extravagantly so. But they’ll also make sure they are saving a bit more than before – just in case. So, their lifestyle (metabolism) is not damaged, it’s just down-regulated. So, if you find yourself in this unfortunate situation, what do you do about it? First, you must assess the situation and determine the severity of change to your metabolism? Low energy levels: Your usual ‘get-up-and-go’ gone back to bed for a lie-down? Serious hunger pangs: You’re so hungry at times that you feel like you could eat your own foot? Extreme cravings: The urge for chocolate is so great, you’d consider selling one of your children for a Kit-Kat? There are a few other indicators: sensitivity to cold, especially in the ends of your fingers and toes. Other common markers are constipation, mood swings and dry skin. However, these may be attributable to other issues, not just a low metabolism. Joking aside, if any of the above symptoms seem familiar, then you either have an undiagnosed medical condition, or you’ve been dieting too hard or over-training. 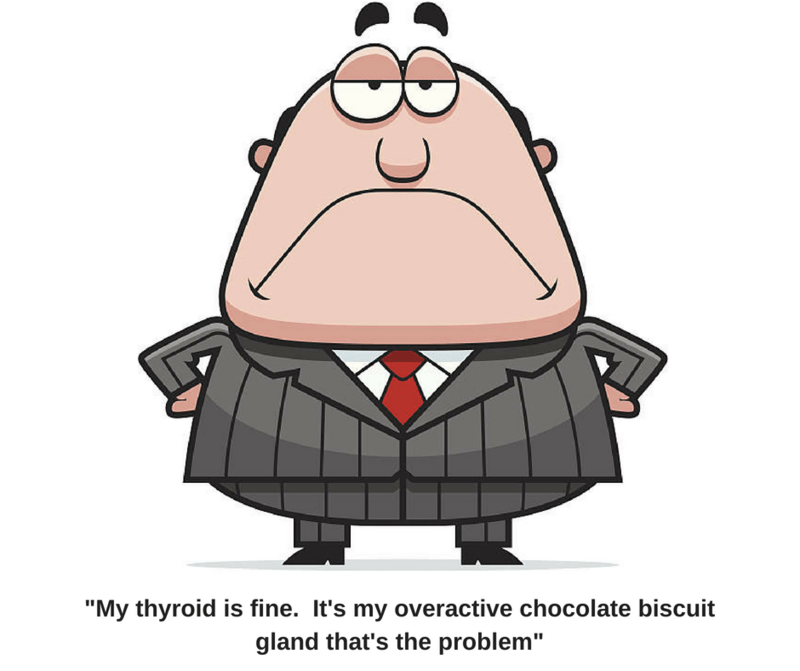 To be on the safe side, have a chat with your GP or medical practitioner and get your thyroid gland checked out. Then, if everything is okay on the medical front, you’re looking at taking immediate action to remedy the situation. First, you’ve got to stop overdoing whatever it is that you are doing. You must do something to let your calorie expenditure balance out your intake. This may require an increase in calories and/or a change to your training routine. Yes, your weight may rise, but it’s only temporary and we’ll offer you some advice shortly as to bringing it back down. Obviously, without details of what you are doing now, we can’t offer a specific solution. However, one of our favourite plans is some form of moving to a calorie cycling plan. The premise is not new or radical, or the latest fad (we’ve been using it for over thirty years). Basically, it involves varying your food intake from day to day, as your lifestyle dictates. The brilliance of this regime is it stops your body from adapting to a specific energy intake. And if you don’t go too low calorie, too often, you will avoid the weight loss plateau. Now, we’re not big lovers of calorie-controlled diets but we make an exception for this one. First, you need to calculate how many calories you burn off daily. You can use a variety of internet tools to come with a figure. However, if you want a rough idea, first convert your weight into pounds (1kg=2.2lbs). Then, multiply this figure by twelve for men, or ten for women. This provides a rough calculation for an ‘average’ man or woman. Note: Don’t add on the calories burnt from activity or exercise because you want to use these extra calories to add towards your deficit. Once you have this number – for argument’s sake, let’s say it’s 2,000 calories – you then convert this into a total weekly amount: 7 x 2,000 = 14,000k/cals. Now, we need to make some sort of deficit in this figure. We usually aim to start with about a 20% cut (2,800 calories), which reduces the weekly calorie allowance to approximately 11,000 calories. You can always cut back a bit more later but remember, don’t do too much too soon. If necessary, increase your activity to burn off a bit more. Your objective is not to eat more than 11,000 calories throughout the week. Rather than simply dividing this figure by seven, you could try three days at 2,000; two days at 1,500 and two days at 1,000 calories. The permutations are entirely up to you. The other option is to ignore calories and look at proteins, carbs and fats. Very simply, eat plenty of protein and only have starchy carbs on the days that you train. You can eat as much veg as you like but rice, pasta, bread, potatoes, etc., are only eaten on training days. Our philosophy is that it’s not how much you have to do, but how little you need to do. In other words, don’t set off at a sprint when a quick walk will do it better. Start your diet with some foods that you know you can take out later. And don’t max-out your training routine in the first month. If this isn’t your style and you prefer to hit the ground running, then break your plan into sections. It will help if you can periodize both your diet and training into two-week blocks. For example, if you diet hard for the first two weeks, then don’t over train. For the next two weeks, step up your training but also increase your food intake. You’ll notice this is another version of calorie cycling. We cover these points in greater detail in our books and we’ve also got more info in some of our other articles (see related reading below). And please get in touch if you’d like any further help. In truth, it’s almost impossible to completely avoid the weight-loss plateau. It generally kicks in at some point, regardless of your best intentions. All you can do is take as many safeguards as possible and watch out for the signs. Trust us, the plateau is never the end of the story. If you deal with it properly, it’s often merely the beginning of a new chapter.